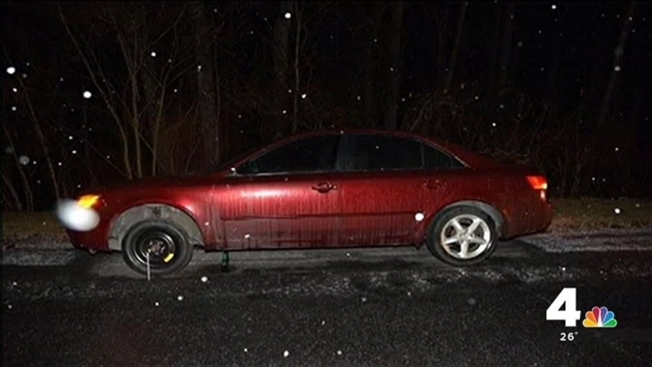 A hit-and-run driver struck an engaged couple as they changed a tire in Maryland on Sunday night, killing the groom-to-be and severely injuring his fiancee. Rick Warrick, 38, and his fiancee were taking Warrick's two teenage children to Dave & Buster's at the Arundel Mills mall when their tire went flat on the Baltimore Washington Parkway in Anne Arundel County, said U.S. Park Police Sgt. Lelani Woods. Warrick, a car salesman from D.C., and his fiancee pulled to the shoulder and got out of their 2007 Hyundai Sonata to change the tire. Warrick had gotten the doughnut onto the car and was tightening the lugs around 9:15 p.m. when they were both struck by a car that did not stop. Warrick's fiancee, 28-year-old Julia Pearce, suffered two broken legs, a broken pelvis and a fractured skull. She tried to encourage Warrick to keep breathing, but he died at the scene. "It's hard on me and I think the right thing will be to do just to turn yourself in. Accidents happen and we understand... it was a tragic accident," said Warrick's mother, Scharmaine Ferrell-Anthony, urging the driver to come forward. His children were in the backseat at the time and were not hurt. They called 911 for help. Warrick's fiancee was taken to Baltimore's Shock Trauma Center for her injuries. Woods said the couple were completely on the shoulder of the roadway north of Route 197 when they were hit. Warrick's fiancee and his children didn't get a good look at the car, and no witnesses have reported seeing the crash. "He or she should pay for it because they took somebody's life... it could have been [Julia's] life too," Pearce's grandmother Doretha Pearce said. Anyone with information is asked to call 202-610-8737.